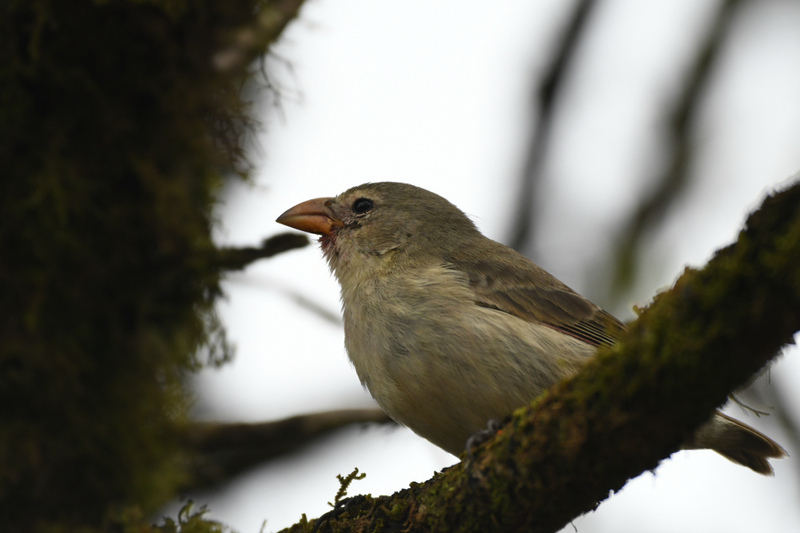 Galapagos is famous for its "finches" (now known to be tanagers); they helped to inspire Darwin's theory of evolution. This one is the endemic Small Ground-Finch. Photo by participant Sid England. Whilst writing this trip list, a lot of stunning memories came to mind. I remember as a young person wondering what the Galapagos Islands were going to be like. After reading books, watching videos, and so forth, you feel like you'll go there once and that's it. Many years and many visits later, I still think that these islands are stuck in time. It's still true that this place is magic, weird, and bizarre -- as you can see when you're there, watching the incredible landscape and animals. Some places are covered with black lava, other places have giant daisies, or many different cacti; even the introduced species look strange there. But when you see the combination of animals adapted to this environment, it's a bit crazy: giant tortoises that have different shells depending on which island they inhabit, iguanas that survive in salty water and dive several meters deep to eat, penguins in the Northern hemisphere, nocturnal gulls, cormorants that can't fly, and Darwin's "finches", with bills that are constantly evolving... All of this sounds like a fantasy, but the reality is that you were there and you witnessed it -- saw and visited one of the most spectacular places on the planet! As we whizzed around the islands, we saw an incredible number of the places and wildlife that the books and videos tell you about. Our group's list of favorites included Paint-billed Crake, Yellow Warbler, Nazca and Blue-footed boobies, Red-billed Tropicbirds, even a Brown Pelican. Finches were popular, with the Mangrove Finch providing a nice surprise. Swallow-tailed Gulls showed what they are capable of; the ones feeding their chicks with squid on Genovesa were admired by many of us. Inquisitive mockingbirds were incredible, especially the Espanola Mockingbirds that came to catch flies and check our group for water sources (with no luck). Many of you decided that the Waved Albatrosses were most impressive, simply because of their looks and behavior. For me, the biggest surprise was how calm the Pacific Ocean was. The Nemo III was comfortable, but even more importantly, it took us to the places to make our adventure a success. So thank you to our captain (Henry) and the crew, who all did a great job. 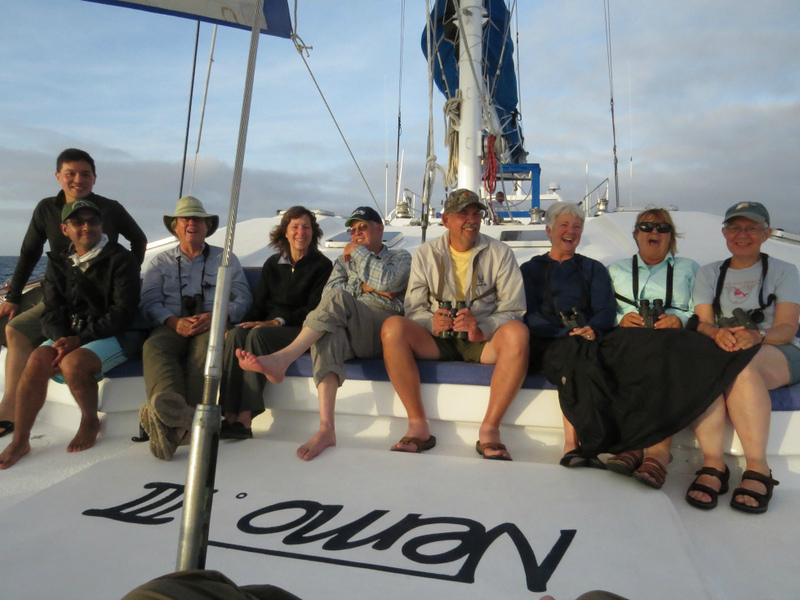 Thanks also to William, our local guide, who helped us with a lot of information about the Galapagos. And as you know, without you, this adventure would not have happened at all, so the biggest thank you goes to all of you for deciding to visit the Islas Encantadas (Enchanted Islands) and for joining us on this trip. I had a great time and hope that you did too. I am sure that you will remember those Darwin's "finches" for a long time! 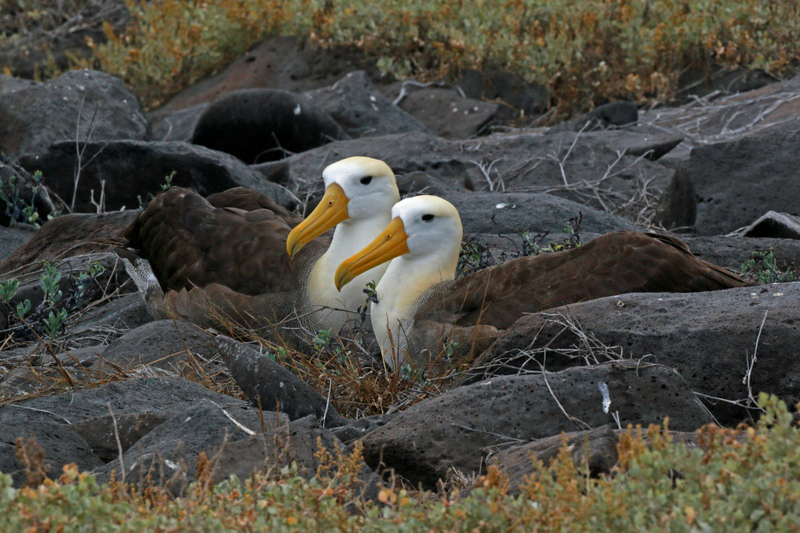 Nearly every pair of Waved Albatrosses on earth breeds on the island of Espanola -- which makes it a very important spot! Photo by participant Randy Beaton. WHITE-CHEEKED PINTAIL (GALAPAGOS) (Anas bahamensis galapagensis) – We saw this duck nicely a few times along the way. PIED-BILLED GREBE (Podilymbus podiceps) – One seen at Humedales on Isabela. AMERICAN FLAMINGO (Phoenicopterus ruber) – We saw a pair when we visited Bachas beach on the first afternoon, and 12 more on Isabela. WAVED ALBATROSS (Phoebastria irrorata) – Great sightings of many of them, plus eggs, chicks, many adults taking off, etc, etc. We saw all of this while visiting Espanola. 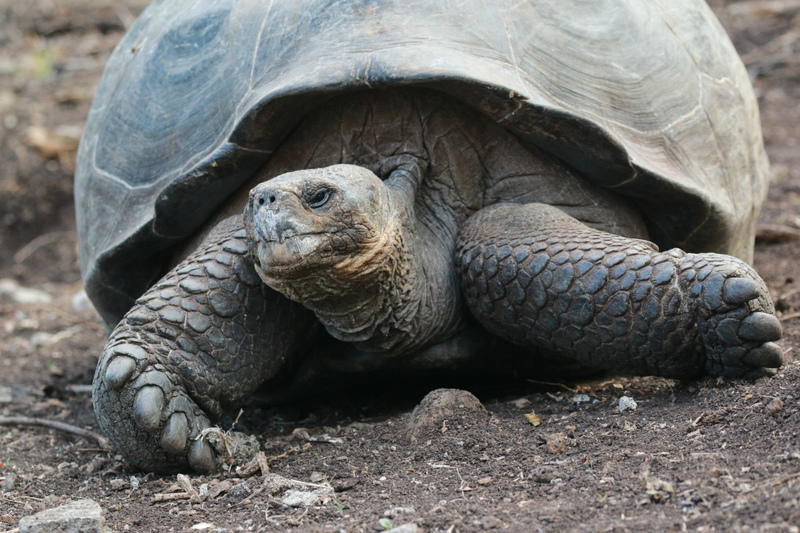 The Galapagos Tortoise ranks among the world's largest tortoises, which is why the species was targeted by whalers in past centuries -- plenty of fresh meat for hungry sailors. Photo by participant Randy Beaton. GALAPAGOS PETREL (Pterodroma phaeopygia) – A few seen from the boat as we were sailing. Unfortunately, we also saw some dead ones in Media Luna which may have been eaten by rats or cats. GALAPAGOS SHEARWATER (Puffinus subalaris) – Very numerous throughout the trip. ELLIOT'S STORM-PETREL (Oceanites gracilis galapagoensis) – This handsome bird was very common throughout the trip. WEDGE-RUMPED STORM-PETREL (Oceanodroma tethys tethys) – Few seen during our sailing, but the big colony on Genovesa was very impressive; there were thousands and thousands of them! RED-BILLED TROPICBIRD (Phaethon aethereus mesonauta) – It was fantastic to see the streamers of this long-tailed bird -- wow! MAGNIFICENT FRIGATEBIRD (Fregata magnificens) – More numerous than the next species, with a purple sheen to the plumage of the males. GREAT FRIGATEBIRD (Fregata minor ridgwayi) – The young ones of this species were very attractive, with ginger heads. 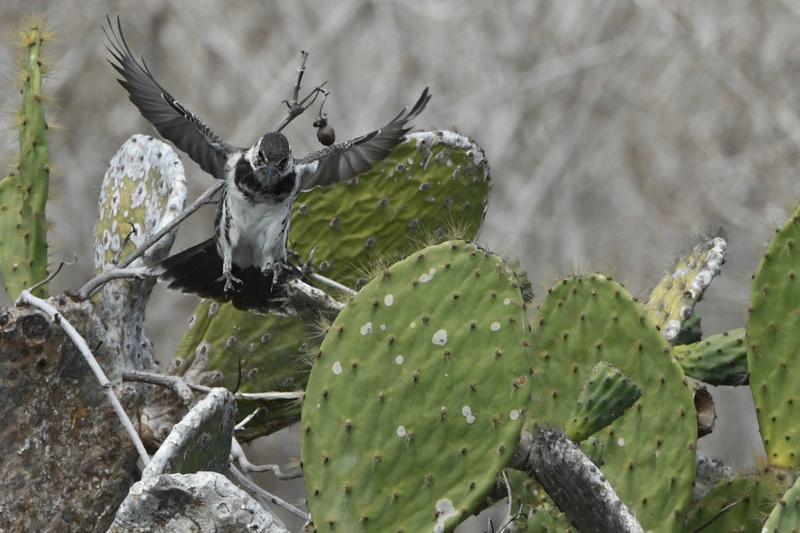 There's no better place to get up-close and personal with seabirds, like these Nazca Boobies. Talk about an optimistically large breakfast! Photo by participant Sid England. 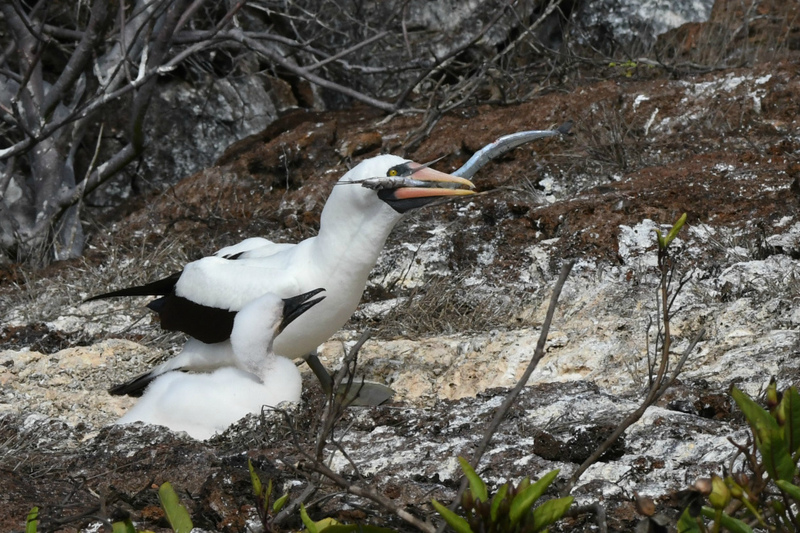 NAZCA BOOBY (Sula granti) – We saw plenty, but the one that got our attention the most was the parent feeding a big flying fish to its chick; that fish was far too big for that baby! BLUE-FOOTED BOOBY (Sula nebouxii excisa) – Not many were dancing but there were plenty to see. The best show was in Santa Fe, where a single bird dived just beside the boat; he got a few black-striped salemas for dinner! RED-FOOTED BOOBY (EASTERN PACIFIC) (Sula sula websteri) – Fantastic close-ups of this species; we saw both the brown morph and the white morph on Genovesa. Very impressive feet and facial "makeup"! The deck of the Nemo III -- a great place for a laugh. Photo by participant Linde Eyster. BLACK VULTURE (Coragyps atratus) – Seen in Quito. TURKEY VULTURE (Cathartes aura) – At least on3 pair was seen in Guayaquil. 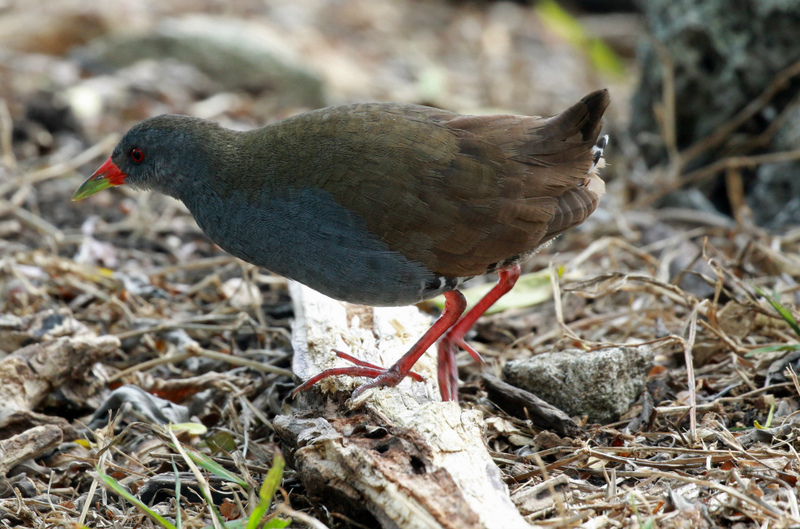 It's not hard to see how the Paint-billed Crake got its name. Photo by participant Randy Beaton. PAINT-BILLED CRAKE (Mustelirallus erythrops) – This bird gave us a show on Floreana, but also at Rancho Primicias on Santa Cruz. PURPLE GALLINULE (Porphyrio martinicus) – We found a young bird at Rancho Primicias. 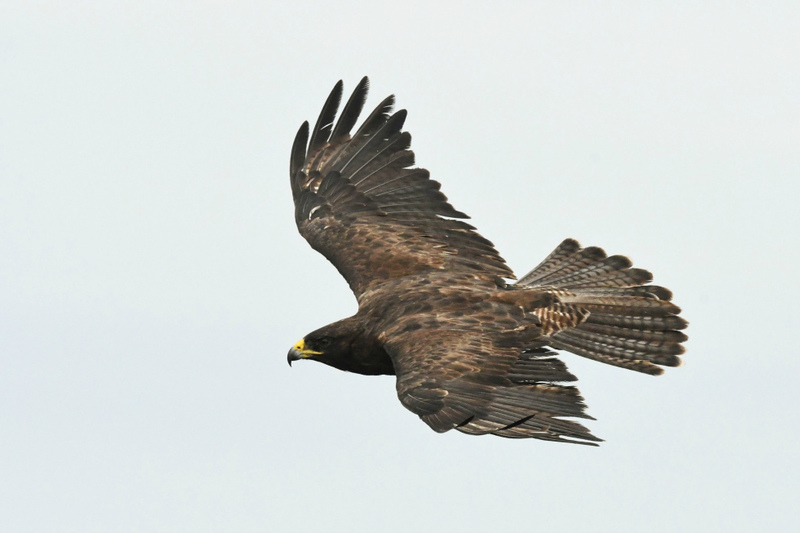 We had fantastic views of the endemic Galapagos Hawk, particularly on Espanola. Photo by participant Sid England. SWALLOW-TAILED GULL (Creagrus furcatus) – People really enjoyed watching this magnificent gull. We saw them in different stages of life, and some of the group saw them following the boat at night. ROYAL TERN (Thalasseus maximus) – A pair was seen in Puerto Villamil. EARED DOVE (Zenaida auriculata) – In Quito. DARK-BILLED CUCKOO (Coccyzus melacoryphus) – Great looks on San Cristobal. 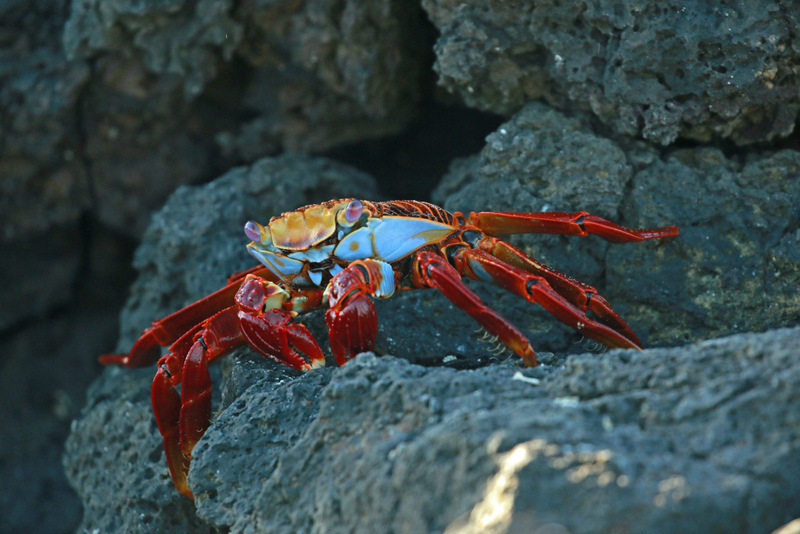 Sally Lightfoot Crabs must surely rank among the world's prettiest crustaceans. Photo by participant Randy Beaton. BARN OWL (GALAPAGOS) (Tyto alba punctatissima) – It was a great catch up with this nice owl on our last day, when the owner of the restaurant where we had our lunch told us that there was one roosting near the store. SHORT-EARED OWL (GALAPAGOS) (Asio flammeus galapagoensis) – They were very active the day we visited Genovesa. SPARKLING VIOLETEAR (Colibri coruscans) – A few in Quito. BLACK-TAILED TRAINBEARER (Lesbia victoriae) – In the garden at Hotel San Jose. WESTERN EMERALD (Chlorostilbon melanorhynchus) – Also in the garden at Hotel San Jose. Now THAT'S how to impress the ladies! 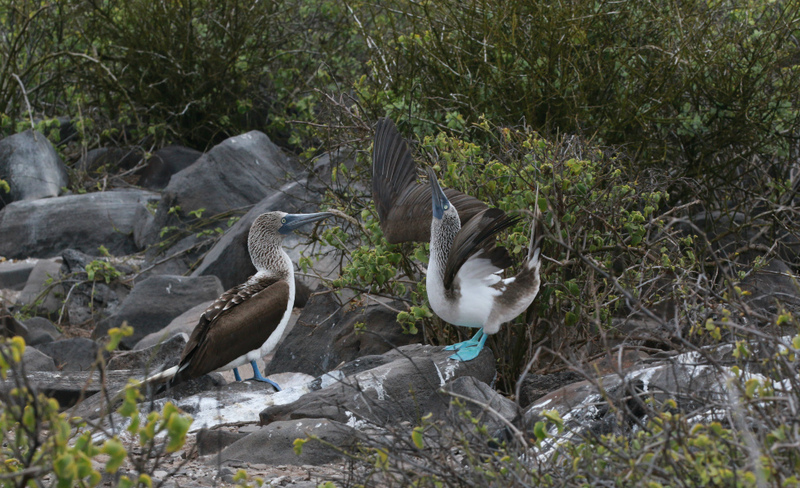 A Blue-footed Booby does his very best courtship display -- and he appears to have that female mesmerized. Photo by participant Randy Beaton. AMERICAN KESTREL (Falco sparverius) – A pair in the garden at Hotel San Jose. VERMILION FLYCATCHER (OBSCURUS GROUP) (Pyrocephalus rubinus piurae) – This is the one we saw in the gardens of Hotel San Jose. VERMILION FLYCATCHER (GALAPAGOS) (Pyrocephalus rubinus nanus) – This is the subspecies we saw on Isabela. 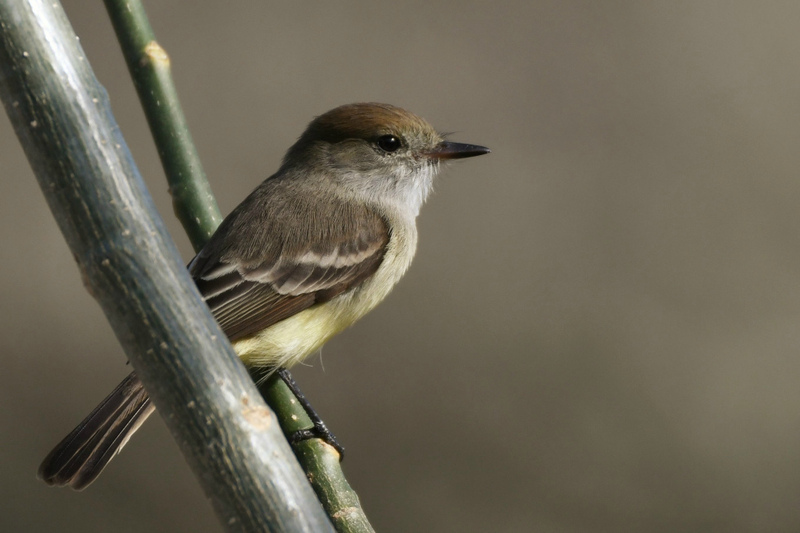 TROPICAL KINGBIRD (Tyrannus melancholicus) – In Quito. BLUE-AND-WHITE SWALLOW (Pygochelidon cyanoleuca) – In Quito. GRAY-BREASTED MARTIN (Progne chalybea) – A pair at the Guayaquil airport. 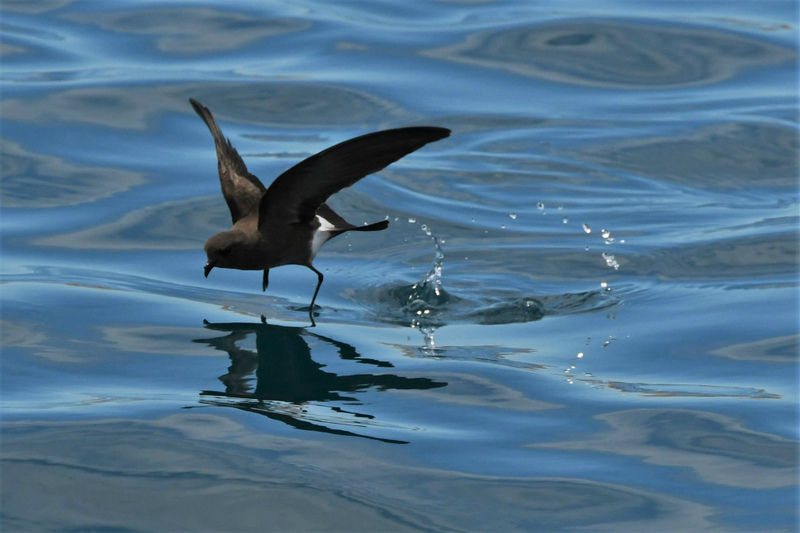 An Elliott's Storm-Petrel dances across the water near Floreana. Photo by participant Sid England. GREAT THRUSH (Turdus fuscater) – In Quito. YELLOW WARBLER (GALAPAGOS) (Setophaga petechia aureola) – The most common bird of the trip but also very pretty. BLUE-AND-YELLOW TANAGER (Pipraeidea bonariensis) – In Quito. SCRUB TANAGER (Tangara vitriolina) – Also in Quito. An endemic, insect-eating Gray Warbler-Finch shows the tiny beak which gives it its name -- quite different than the stout, stubby beaks which characterize the seed-eating "finches". Photo by participant Sid England. RUSTY FLOWERPIERCER (Diglossa sittoides) – Another one seen only in Quito. SAFFRON FINCH (SAFFRON) (Sicalis flaveola valida) – Some at the Guayaquil airport. The Floreana Mockingbird is among the world's most crtically endangered birds, with less than 150 remaining, restricted to one tiny islet. Photo by participant Sid England. MANGROVE FINCH (Camarhynchus heliobates) – We were very lucky to see this very, very rare bird, especially the second one which was so close. Great! The Woodpecker Finch is one of the larger-billed "finches". It's also one of the few tool-using bird species in the world. Photo by participant Sid England. RUFOUS-COLLARED SPARROW (Zonotrichia capensis) – In Quito. SCRUB BLACKBIRD (Dives warszewiczi warszewiczi) – At Guayaquil airport. GREAT-TAILED GRACKLE (Quiscalus mexicanus) – Also in Guayaquil. 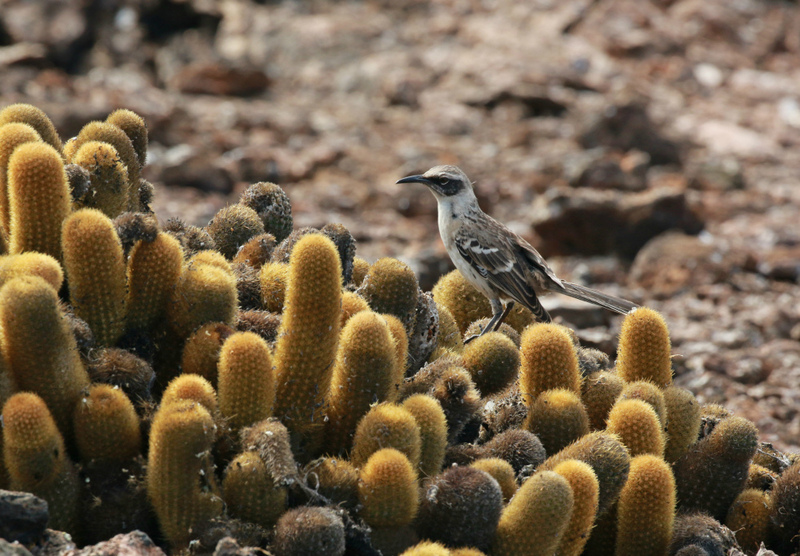 Two endemics: a Galapagos Mockingbird, which is the most widespread of the archipelago's mockingbirds, checks out a Lava Cactus. Photo by participant Randy Beaton. HOODED SISKIN (Spinus magellanicus) – A male was seen nicely in the gardens of Hotel San Jose. HUMPBACK WHALE (Megaptera novaeangliae) – Very briefly seen by some people. 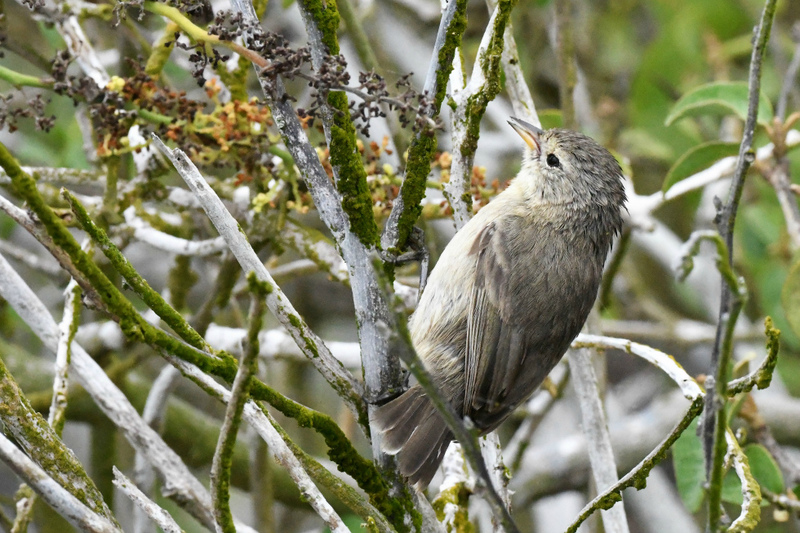 The diminutive Galapagos Flycatcher is widespread across the islands. Photo by participant Sid England.